"Your work has brought me to tears (of joy of course! ), and you have made my husband and I the #1 gift-givers in the family. Both sets of our parents have so enjoyed their stone masterpiece and continue to admire and show them off whenever they can. You truly have an incredible talent and we are so very lucky to know you and to have enjoyed your art." "A great gift for someone "who has everything!" Clients who moved from Upland, CA to Santa Fe, NM and wanted to take a very special place on the Scripps College Campus with them. 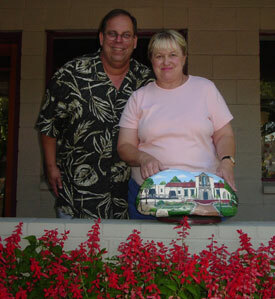 "We have lived for 18 years in Upland, CA. One of our favorite things was to go to the Motley Coffee House on the Scripps College Campus and have coffee and talk. It was a renewing experience for us. Dawn not only painted the coffee house, pond and sculpture on one side of the rock, she also painted another campus location with our favorite bench amid the beautiful trees and gardens on the other side." Dawn painted their Yacht "Crosser" which was built for their around the world cruise. Their daughter and son-in-law commissioned Dawn to paint it as a surprise. "Thank you for making our Christmas so special! Thank you for such a beautiful addition to our home...it is a one of a kind treasure." Dawn talks with honoree, Else Blangsted before "reveal"